If the idea of Cate Blanchett, Chris Hemsworth, Tom Hiddleston, and Jaimie Alexander summoning lightning bolts aimed at each other on Asgard wasn’t enough to excite you for Thor: Ragnarok, well then you need to reevaluate a few things. Please also be advised that Thor’s ethereal roster has expanded: Creed’s Tessa Thomson is joining Thor 3’s already insanely attractive cast, and possibly for multiple Marvel movies, The Wrap reports. 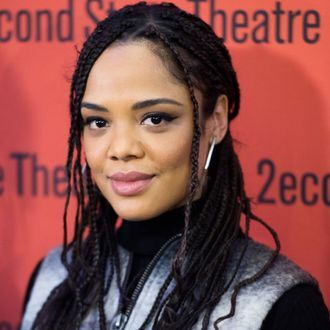 There are no details on her character just yet (though she’s rumored to be playing the female lead, since Natalie Portman isn’t returning), but in which of the nine worlds does Tessa Thompson not get to be a Norse goddess? She’s hot off playing the headstrong woman in practically-a-god Adonis Creed’s life, so really, she’s already done the job. Thompson’s addition also means Thor 3 will be about as diverse in front of the camera as it is behind the scenes; its director Taika Waititi is Marvel’s first director of color, while the film will have the MCU’s third female writer. Thompson’s Creed director, Ryan Coogler, has of course already been tapped to direct Marvel’s Black Panther, while Creed himself, Michael B. Jordan, co-starred in last year’s Fantastic Four reboot (yeah, that one still stings). So the Creed-to-Marvel movement is now officially a thing — someone find Stallone a superhero costume.